The Commission’s decision in Microsoft/Skype contradicts its previous Article 102 decisions in Microsoft I (WMP) and Microsoft II (Internet Explorer). “consumers do not simply use whatever communications product is provided with Windows. The consumers use multiple communications services on multiple platforms, such as Apple iOS and Android, which include their own built-in communications services (Facetime and Google Talk). The parties further submit that some online communications applications such as Facetime and Viber are not even made available for the Windows platform, and yet they are very successful”. This § tramples on the theory of harm used by the Commission to nail Microsoft in 2004 and 2009: ie that lazy consumers do not use more than one software (no multi-homing), and that they tend to stick to the the default software preinstalled on the platform (users inertia). Now, the § reproducted above misquotes the Commission’s decision. In reality, § 151 starts with: “In addition, the parties claim that consumers do not simply use whatever communications product is provided with Windows” blablabla. But is this really the parties talking here? “151. 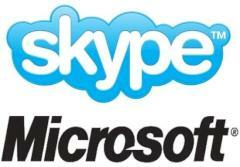 With regard to a possible tying between Skype and Microsoft’s products, the Commission considers that most of the arguments mentioned above in order to demonstrate the absence of incentives for a strategy of degradation of interoperability (in particular the necessity for Microsoft to maintain and enhance the value of the Skype brand) are also relevant to the assessment of the strategy of tying. 152. In addition, the parties claim that consumers do not simply use whatever communications product is provided with Windows. The consumers use multiple communications services on multiple platforms, such as Apple iOS and Android, which include their own built-in communications services (Facetime and Google Talk). The parties further submit that some online communications applications such as Facetime and Viber are not even made available for the Windows platform, and yet they are very successful.153. Moreover, consumers increasingly prefer services that offer online communications as part of a broader user experience such as Facebook, the recent Google+ and Gmail, which all run on Windows. 154. Competitors would therefore have many possibilities to market and many different means available to attract consumers. 155. In the course of its investigation, the Commission has not received any substantiated replies demonstrating that Microsoft has incentives to tie Skype and Microsoft’s products”. Read in context, §151 sounds like Commission’s thinking. There is no rebuttal, no discussion of the parties’ submission. And §151 is planted in the middle of bunch of other Commission arguments, all supportive of the view that there is no risk of bundling. Now, it would have looked bad for the Commission to say black in 2004 and 2009, and then reverse to white in 2011. So our Commission friends probably decided to use the parties as scapegoats, and (i) conveniently avoid the blame of inconsistency in decision making; or more plausibly, (ii) the pain of explaining why users of communications services are geeks shopping for software, distinct from the lazy users of media players and browsers. PS: stay tuned, my little finger tells me that Alfonso will report on this case very soon.